Picture the scene: you’ve decided to go on a camping trip with that special someone and get away from it all. You’ve fished, hiked and roasted every marshmallow you brought with you, and now you’re looking to settle down for the night with a film. One problem though, you decided your phone would be a distraction, so you left it at home. Now you’re left with nothing to fall asleep to except the deafening silence of the countryside, and the disappointed gaze of your significant other. Luckily, I’ve put together a list of the best portable TVs of 2019, so you can prevent this from happening to you the next time you decide to take a trip somewhere remote in the name of relaxation. Out of all the portable TVs we considered for this list, the RCA T227 was the least expensive, but that doesn’t mean that it’s low quality. 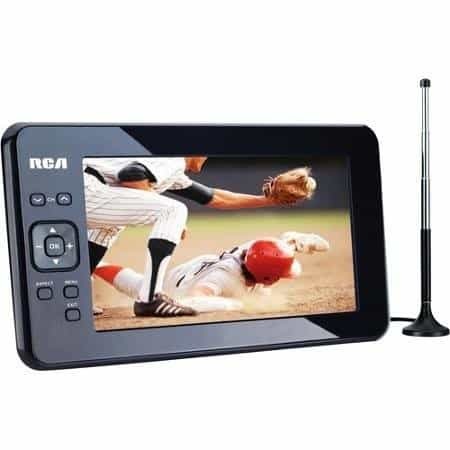 On the contrary, this cheap portable TV packs a 7” screen and a built-in ATSC digital/NTSC analog tuner so you can catch up with your favorite shows no matter where you are. But it’s a handheld TV, wouldn’t it be a pain holding it up if I wanted to watch something lengthy? What if I wanted to watch something late at night? Not a problem, this model comes with a flip-out stand and a headphones jack, as well as built-in speakers in case someone else wants to watch it too. Now let’s talk design. All too often, even if the specifications are good, the manufacturers skimp on the look and feel of the product. That’s not an issue here; the T227 features a sleek black design with rounded edges, more reminiscent of a tablet than what you picture when you think of a portable battery TV. 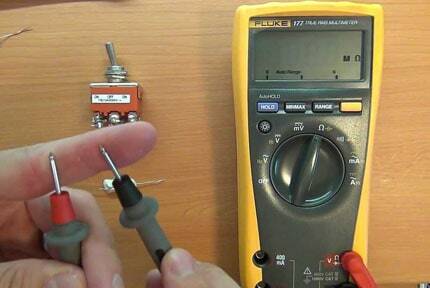 Now when you see a product this good, for so little cost, there are bound to be downsides, and the T227 is not without its faults. Specifically, the battery life isn’t fantastic, although it does come with an AC power adaptor, so you can recharge it from an outlet, or pay a little more and get a cigarette lighter adapter to charge it on the go. The other main issue with this TV is that the included antenna isn’t incredible, but you can pick up a better replacement without much trouble online. All in all, we’d say this is one of the best budget mini TVs for sale today. If you can look past it’s few faults, you just might find this to be just what you need the next time you leave town for a weekend. Take a look at this. 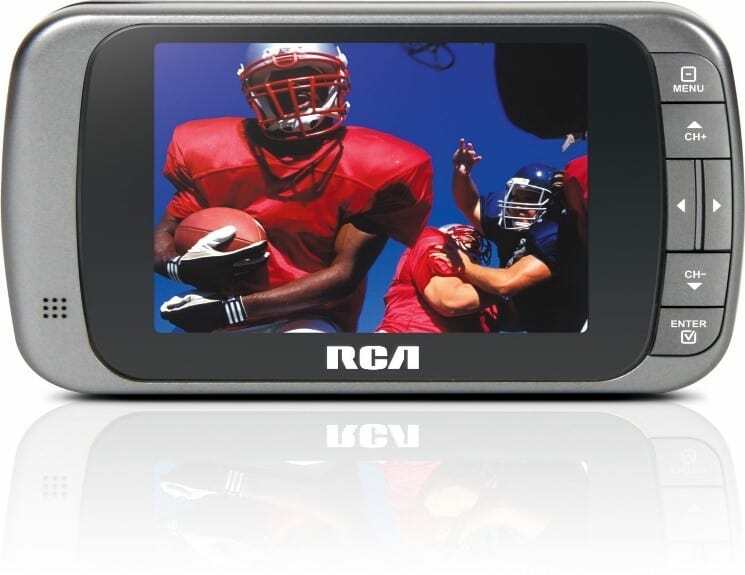 The RCA DHT235A is the ultimate small portable TV. With a 3.5” screen, headphones jack and real-time signal strength display, you are always ready to watch some TV. 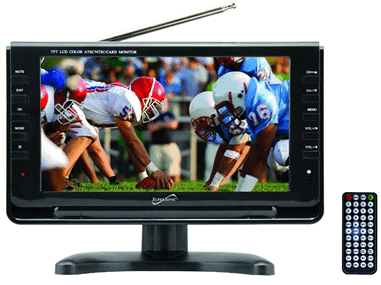 And get this, the advantage the DHT235A has over other portable televisions for sale? As well as being able to take an AC connection, it can also run on good old-fashioned AA batteries. That means no more worrying about whether you have enough power left to finish your show, or if you can make it to a power outlet before Stephen Colbert comes on, just make sure to pack enough batteries and you’re golden. Add to this the fact that it weighs a little under 6 ounces, and is less than 5 inches tall, and you’ve got a portable battery TV that you can slip right into your back pocket. The disadvantages of this model are that, by definition, it’d be difficult to watch this with another person, due to the compactness of the model and the small screen size. Additionally, the built-in speakers are fine, but the sound quality drastically increases when wearing headphones. This model also has a lower resolution than other comparable portable TVs, so don’t expect to watch anything with a lot of fine detail. Overall, a solid, good quality, low maintenance handheld TV for a low maintenance kind of person. When we read this TV’s specifications, we knew it deserved a place in this list. This TV is built around the concept of versatility, and ultimately, isn’t that the whole reason for owning a portable TV? It comes with a 9” screen and removable stand, as well as everything you could possibly need when you take this model out of the house, including a remote control, an AC adaptor, a car charger, an external antenna and A/V cables. The big advantage here is that since this model supports AV cables, you can connect just about anything you want to it, including older games consoles, VCRs, camcorders, you name it. This makes the TV a fantastic way to kill time when camping, just charge it up, pack your old Nintendo and while away the hours. On this point, the SC499 has the longest battery life of any TV on this list, which is a big plus if you aren’t a fan of constantly recharging your devices. This is one of the bigger portable TVs in this list, and at 9 inches, it’s more than suitable for watching with others, but in case you’d like to watch something on your own, it also has a built-in headphones jack. If you do happen to be more socially minded, though, this TV also has a number of inputs that make it invaluable, namely a USB port and an SD card reader, perfect for loading up films or music on before you head out. The size of this model is perfect even at home as a kitchen TV, since it’s not too big, and not tiny, has a remote control and can be mounted to the underside of a cabinet should you choose to do so. As far as disadvantages go, this model can be a bit temperamental and may require some moving around before you get a signal, but since the built-in antenna stretches, this shouldn’t be too much of a problem. The power cord is also a little short for our tastes, at only 111cm long, so bear that in mind when choosing a position. 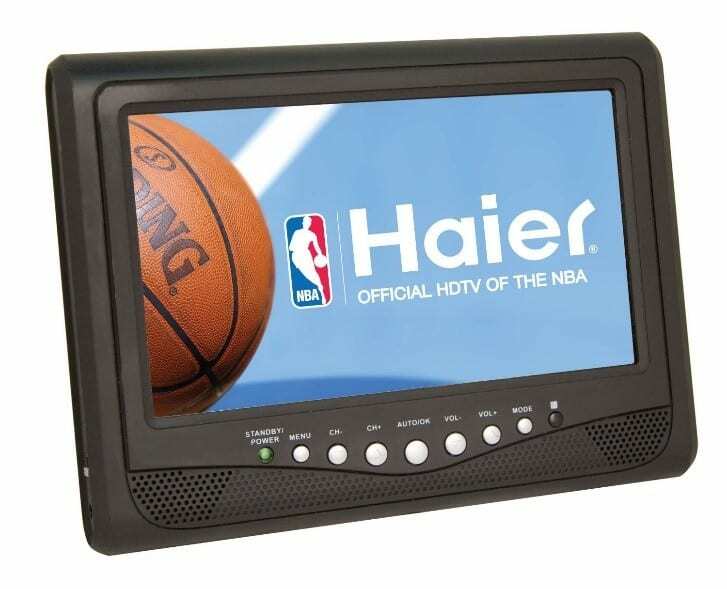 The Haier HLT71 came out way back in 2009, and is still going strong today. Its main selling point is that it has a 7”, 720p screen, when usually, portable TVs for camping come with a 480p screen at best. Despite it having a higher quality screen, it doesn’t compromise on battery life, with each full charge lasting up to 2 and a half hours. That’s enough time to watch Goodfellas from start to finish. This model also boasts a switchable aspect ratio (16:9/4:3) in case you want to watch widescreen content. Like the SC499, this also comes with an audio/video connector, so you can connect it to a huge range of inputs, but with higher output quality than the SC499 could provide. The HLT71 has a twin speaker system built in which delivers a good, rounded performance, but also features a headphones jack in case you want to keep things quiet. It has a built-in ATSC/NTSC tuner, but you can also connect it to a coaxial cable if you’re using it indoors. The main downside to this model is that the design is less refined than other portable TVs in the same price range, and again, the built-in antenna could do with an upgrade, as it’s sometimes difficult to get a television signal. Ultimately, if you’re looking for quality and don’t mind paying for it, this is the portable TV for you. If you’re the kind of person who likes to take a trip on a boat, or in an RV, then this is the model for you. 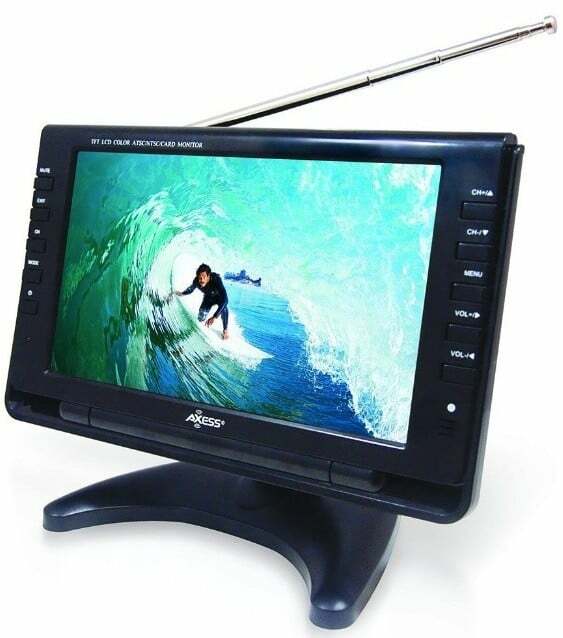 This portable TV comes with a 12V adaptor, so you can power it from the boat or RV’s battery, and if you stop somewhere with a standard outlet, you can just switch to a standard adaptor and save your batteries. The Axess TV1703-9 has a 9” screen, which displays content at 480p. It also comes with a USB input and SD card reader, which is great for chasing boredom away on the road (as long as you load it with content before you set out). The built-in speakers provide an adequate performance, and as usual, there is a headphones jack built in, however, an area where this model really shines is on the viewing angle. This model features a removable stand, which is ideal since boats and motorhomes can be slightly cramped spaces. What if you don’t want to hold the portable TV? You’re going to have to set it down somewhere, right? And what if the only place you can put it requires you to be at a weird angle to the screen? No problem. The TV1703-9 has a great viewing angle, with clear pictures from just about any direction. And if you do end up putting it across the room, it comes with a remote control, so that isn’t an issue. Again, the design is fairly plasticky, but if you can look past that you’ve got a great little piece of kit here which just begs to take on holiday with you. Now the problem with all the other handheld TVs in this list is the fundamental problem with all portable TVs. You can’t watch them whilst in the car because you’re moving too fast to keep a signal. This model, however, is made for in-car use and comes with a car power adaptor and headrest mounting carry case. Make no mistake, you still won’t be able to watch TV in the car, but you’ll be able to use the built-in DVD player with no problems whatsoever. Finish your film before you arrive at your destination? 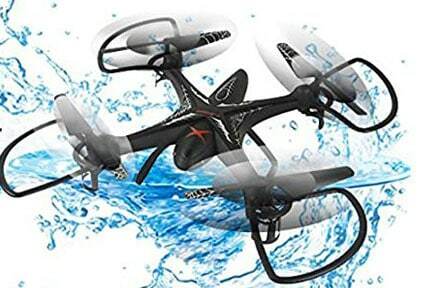 The ED8850B comes with USB and SD card input, so you can load those up with more music or films to keep you occupied. 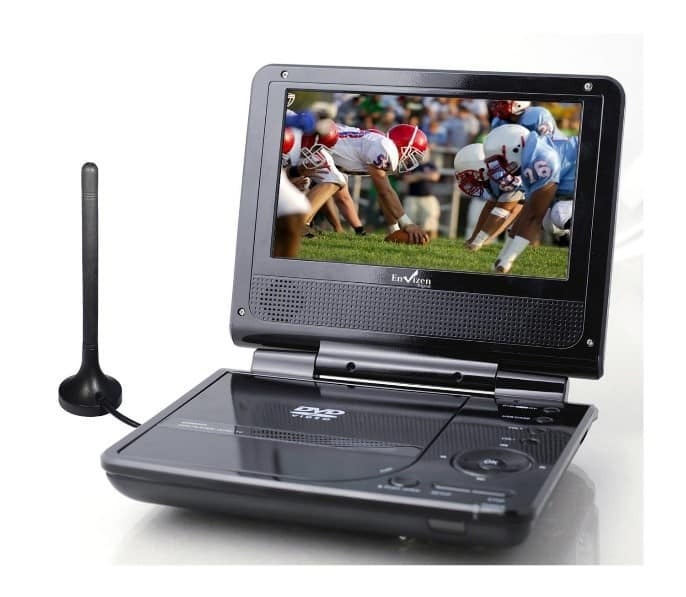 Because this portable TV comes with A/V inputs, you can even connect a games console to it. Remember back in the day, hearing about rich people who had Playstations in their cars? That could be you! Let’s talk about the TV functionality. It comes with a detachable antenna, but as usual, this isn’t great, so expect signal reception to be a little spotty unless you upgrade. It has a built-in ATSC digital tuner and an on-screen channel listing, so you don’t have to waste time going to the shop and picking up a TV guide. The 7” inch screen is clear and displays vibrant colours in 480p, while the unit itself has a battery life of up to 2 and a half hours. The internal battery charges automatically whilst plugged in, or you can buy additional external batteries for a little extra. All in all, this is a solid little TV which is perfect for those who travel a lot, with no real downsides and would be a fantastic first entry into the world of portable TVs. For this list, we’ve scoured the internet high and low for information and brought you our list of the top portable TVs. We’ve taken the strengths and weaknesses of each into account and have decided that the overall winner is the Axess TV1703-9. It’s a solid all-rounder that’s as practical as they come, and affordable to boot. However, as there are many different uses and requirements for a portable TV, it might be the case that there’s a TV more fitting to your needs elsewhere on the list. If so, don’t worry, we only featured the best of the best, and they’re all fantastic in their own right, so buy with confidence and happy viewing.